For sale we have a rare treat for all you Mopar enthusiast.The one we have for you is a V Code Car which means it's a factory 440 Six Pack car. 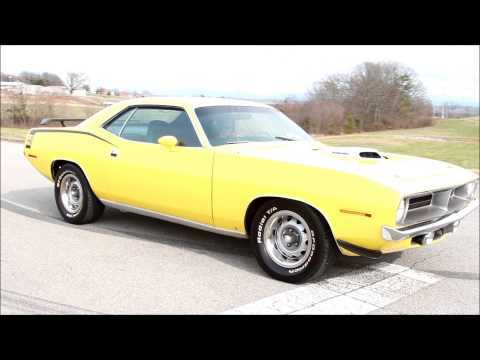 This Cuda has a date code correct 440 Engine just not Matching #s. This being a Six Pack car it has the shaker hood along with the rear wing and front spoiler. It also has the road lamp package. It's painted in the factory Color scheme Banana Yellow with the Black 440 Stripes. The paint shows very well with a slick finish. This Cuda has nice glass and trim. The rear valance has the cut outs for the dual chrome tips. The final touch is the factory Ralley Wheels with White Letter Tires. On the inside it's also done in the factory black color scheme. It has the correct bucket seats and console. Also it retains the factory seat belts. The seats, console, door panels and headliner all looks good. The radio was changed to an Am FM Cd Player. To finish off the interior it has the custom Wood Steering Wheel. Under the hood it all looks correct with the only change being the vintage Heat and AC. It's powered by a '70 Model 440 with the 3x2's. The trans is a 727 Torque Flite Automatic that is mated to the 8 ¾” Rear End. The engine looks as it would have new with it being painted and no chrome. It has the stock manifolds and dual exhaust. To help it stop it has factory Front Disc that are Power with drum out back. It also has Power Steering. When you look under this 'Cuda the bottom looks great with solid floors and frame rails. This is a Muscle car many people dream of, don't sleep on it because she won't be here long. If we can help you in any way with questions or a specific picture, you can call our office at (865)988-8088. Or feel free to call Daniel at (423) 807 0600, Devvin at (865) 256 2366, or you can e-mail us at sales@smtclassics.com.